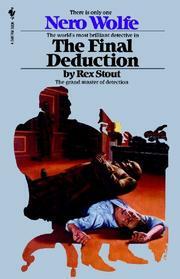 Nero Wolfe, as pettish as Archie Goodwin is truculent, works for a tenable answer when Mrs. Vail hires him in the matter of her husband's kidnaping. The ransom paid, Mr. Vail is returned but Mrs. Vail's secretary is murdered and then Mr. Vail is killed. A run through of family, the possibility of fraud, the irritation of the police, put Wolfe on the beam for a tight closing of the case. Well mapped.